The Federal Point Historic Preservation Society would like to recognize the Island Gazette this month as our Featured Business Member. The Gazette, our local newspaper, has been a Business Member of the FPHPS for many years and a supporter of our projects. The Gazette features an ad each week for the History Center events as well as an article describing our Local Flavor Cookbook. Inside the Island Gazette you will find local sports, ads for local business and editorials. The Gazette will publish it if you send it and controversy is sometimes seasonal depending on the election year. Regardless of the year, the Island Gazette is entertaining and informative always and we look forward to every Wednesday just to see what is happening in our small corner of the world. Regular features also include the Baby of the Week, Beach Beauties, Pet of the Week, Trivia, History, Spotlighted Local Business, local fishing reports and much, much more. 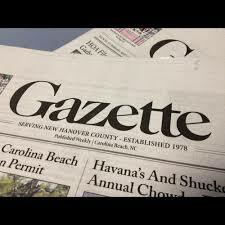 Look for the Island Gazette all over town on Wednesday afternoons in paper boxes. Don’t forget that a lot of local businesses keep a stack of The Island Gazette for customer’s appreciation. Don’t miss another issue of the Island Gazette and for only 50 cents, it is a bargain for entertainment. Be sure to read the ads and articles for your Federal Point Historic Preservation Society and support our local businesses listed in the Gazette and when you do, tell them you saw their ad in the Island Gazette. Thank you Island Gazette for all you do for the island community and for your continued support for the Federal Point Historic Preservation Society. We appreciate you!